It’s a cold and breezy Tuesday this week, with a wind that makes you feel like change is a’comin to this end of Pennsylvania. The forecast tonight is a dip below freezing and there’s a good chance this will be the last week a colorful and lush view shows up in Cathy’s weekly meme. 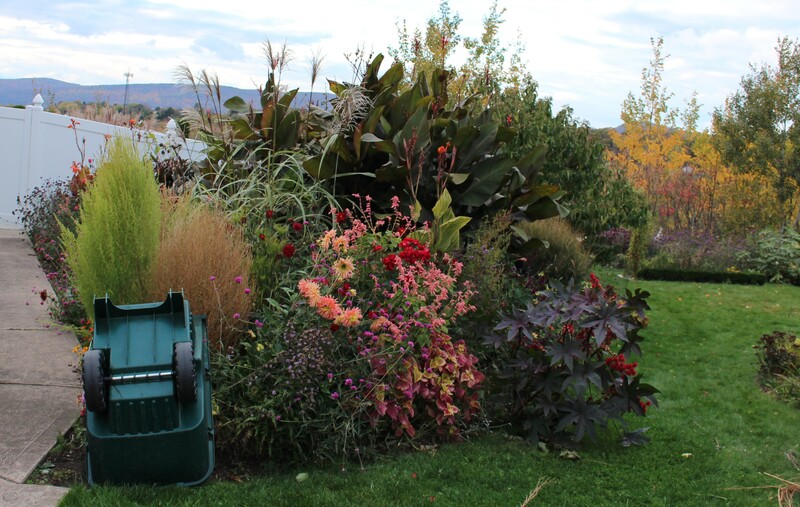 There are still a few weeks left to the season, but after frost hits the view will be decidedly less colorful. A gloomy, gray Tuesday afternoon. The last of the autumn color has worked its way down the mountains and into the garden and things are entirely autumnal. The wheelbarrow is covering the flowering thistle, I’m hoping to get a few ripe seeds before it freezes. One last view. The tropics have been good to me this year. So next week will likely show some serious changes. Once frost hits I like to get things out of the way and cleaned up fast so that I can put down some mulch before winter hits. Any unmulched areas will likely sprout a carpet of winter weeds such as hairy bittercress and I’d rather not start next season with that kind of a mess on my hands. Wish me luck. After you wish me luck please consider giving Cathy at Words and Herbs a visit to see how autumn is progressing through other gardens in other parts of the world. It’s always a great visit and a fun way to keep up over the season. Have a great week! 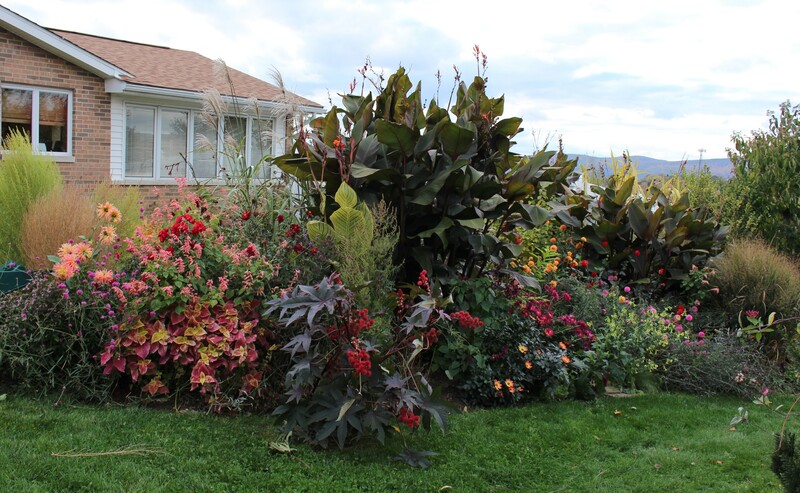 This entry was posted in annuals, fall, garden design, summer bulbs, Tropical garden, Tuesday view and tagged fall, garden, tropical garden, Tuesday view. I wish I were that ambitious. I’ll be lucky to get my cannas and dahlias dug before the ground freezes. I will hopefully get my teenage son to mow the leaves and I will put that around the few Hydrangea macrophyllas that haven’t been yanked. But no garden wide mulching goes on in the fall around here. Don’t get the wrong impression! My idea of gardenwide mulching is mowing the lawn and dumping the bag on the beds. I wish I could afford a nice load of bark mulch or compost, but I’m far too cheap and would much rather spend the money on plants! A sad farewell to your beautiful tropical garden. Until next year! Jason what have you been up to? Is there now a ‘huddled mass’, ‘wretched refuse’ filter on WordPress? This comment didn’t go to spam but it did need approving instead of immediately posting. WordPress seems to feel I need watching, I guess. Your border has been amazingly colourful, such a joy to see. Hope you manage to stay ahead of your weather and get your precious plants inside in time. The above ground plants have been saved, but that was only two plants… the rest are all roots and tubers which can be dug over the next few weeks. My fingers are crossed for a comfortably warm afternoon in which to finish up! It has been wonderful all summer Frank, and to think that at the end of October you have still got all that lush foliage and gorgeous colour! I am so glad you have joined in with the weekly view. We’ll have to do it again next year too! I am feeling rather despondent about my garden right now. We haven’t had frost, but the damp and misty weather is making everything flop and mold and generally look yukky, so I will also be tidying up over the next week or so. Thanks for having me, and thanks for hosting! I’m feeling the same way towards the garden. I want to cut it down and put it to bed under a blanket of mulch. With the leaves beginning to rain down I hope I have enough energy to get it all done! Reading about your expected frost and imminent snow makes me realise how lucky I am to live in a climate that has relatively mild winters. But for today let me just enjoy with you the great success of your tropical border this year. I always think this is one of the things that is hardest to achieve so hats of to you. I will miss my weekly shot of colour from seeing your post each week. I sincerely hope you do manage to get all the mulch spread before the snow. I hope there will be other bursts of color. I may have to move indoors, but as I get settled in here and the kids grow more self sufficient I’m finding more and more time to entertain myself. Still a lovely view, Frank, although the canna doesn’t look happy about the cooler weather. Yes, we’re at that point where we have to give in to nature. Good luck with the clean up! … except for the mildewed verbena. I began trimming that down yesterday. We cleaned up a lot today. I can’t stand the dead stalks, esp. after the snow flattened everything. Even the grasses had to be cut. Sad, we usually enjoy them through Dec.
Amazing, isn’t it, how frantic things can become at the end of a the warmth, potting up or otherwise protecting plants one wants to save. Have just gone through a similar exercise here n Virginia. The expected freeze didn’t come, but it will soon. Hi Tim, nice to see you here! We did get the freeze and it’s a different world out there this weekend. Kind of refreshing but I miss wandering through the warmth and bees and butterflies. Strangely enough my potting up and protecting this year was oddly organized. Usually it involves a flashlight, muddy feet, cold hands and wet pajamas. So, did you get snow? 🙂 The weatherpeople were trying to scare us with a bit of that last night, but thankfully there was nothing. I am soooo not ready for anything resembling the white stuff! Once again, congrats to your achievement: this border is absolutely stunning, awesome, mind-blowing…no wonder are you pleased 🙂 Do you dig the plants up and overwinter them indoors? That Tetrapanax would look great in that planting by the way 😉 You could sink the pot into the ground. If I ever have the chance to get a tetrapanax I will!